Cover Illustration for Oxford University Press study guide. Illustration and flyer design for Wonderland club, London. Editorial illustration for Artists Network magazine on how fine artists are turning to illustration work to supplement their income. Illustration for book review section of the BIg Issue UK. Flyer illustration and design for Wonderland club night in London. Brochure and marketing illustration for Brighton Fringe 2018. The fringe is the largest multi-arts festival in England. 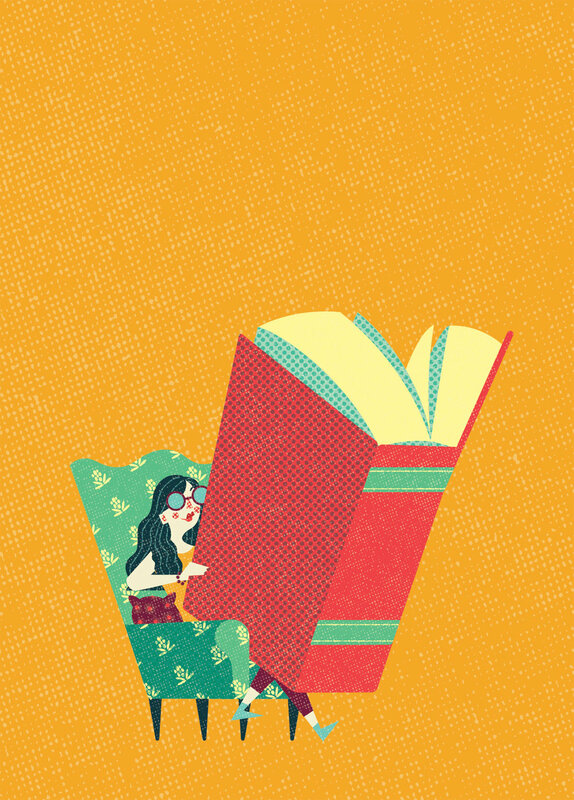 Editorial illustration for The Economist’s 1843 magazine on book length in literature. The big end of year quiz. Editorial illustration for The Big Issue Australia. Illustration for the Royal College of Speech and language Therapists (RCSLT) UK for their relaunched website. Editorial illustration for the Pharmaceutical Journal on immunotherapy for diabetes 1. Editorial illustration for The Economist’s 1843 magazine on pet expenditure in the USA. Why does my cat massage me? Illustration for Doodle My Google, a site visualising people's google searches. A3 prints available with all proceeds going to charity. Cover illustration commissioned for a Walter Scott Investments research paper, from Bladonmore Communications consultancy. Illustration commissioned for a Walter Scott Investments research paper, from Bladonmore Communications consultancy. Double page spread for Women's Health UK magazine. Illustration to celelbrate over one million trees being planted by Illustration Ltd. in conjunction with Weforest.org. A collection of icons created for Brighton Fringe 2018. Pub sign commissioned by Jones Knowles Ritchie for Young's Brewery. Young's are currently in the process of updating and modernising the signs for nearly 120 of their pubs across the UK, and each sign reflects the story and unique character behind each establishment. Editorial illustration for Women's Health magazine UK. Private commission from Irish advertising agency, The Public House, to celebrate their creative director's fortieth birthday. Editorial illustration for The Boston Globe newspaper. Editorial illustration for 1843 magazine, the arts and culture publication of The Economist. The data article was on attitudes to infidelity amongst a number of European nationalities. Illustration for Brighton Fringe Festival 2018. Cover for school diary promoting healthy living to teenagers. Created with Red Dog Design for Unique Publishing Ireland. Editorial illustration for 1843 magazine, the arts and culture publication of The Economist. Editorial illustration on gender imbalance in the film industry for 1843 magazine, the arts and culture publication of The Economist. Cover illustration for Bulletin magazine, the monthly publication of the Royal College of Speech & Language Therapists. Personal illustration commemorating the return of the BBC's cult comedy show 'The League of Gentlemen'. Cover illustration for Wine Republic magazine, Argentina. Illustration for Migrate magazine, the publication for the South African Advertising Awards. Promotional illustration for Pot Noodle marketing campaign. Editorial illustration for UMASS, the quarterly publication of the University of Massachusetts, USA. Illustration for Umass, the magazine for the University of Massachusetts. Illustrated beer label for Avant-Garde Artisan Brasseurs, Canada. Limited edition poster for Wes Anderson exhibition 'Unpaid Interns', Australia. Limited edition screen print in collaboration with Damn Fine Print and Bram Stoker Festival, Ireland. Editorial illustration for Focus on the Family magazine, USA. Limited edition screen print for Artcrank USA exhibition, UK. Promotional illustration for Britvic soft drinks. Editorial illustration for Wine Republic magazine, Argentina. Editorial illustration for New Internationalist magazine, UK. Limited edition screen print for Damn Fine Print and Sure Shots Film Festival, Ireland. Editorial illustration for Live Happy magazine, USA. Limited edition screen print for Damn Fine Print, Ireland. Illustrated portrait for Offset design and creative conference, Ireland. Editorial illustration for Pickles magazine, UK. Illustrated playing card, Playing Arts, EU. Poster portrait for 'State of Us' exhibition with Illustrators Ireland and Offset, Ireland. Illustrated promo flyer for Wonderland music festival, UK.